Fashionable Heart: MAC is an addiction. My MAC collection is growing. It's nowhere near huge, but I've gotten some great basics. It can be expensive, so I try to stick to the stuff that I know that I will actually use. There is nothing more that I dislike than having makeup in my collection that collects dust. :) Here is what I got this past weekend! I have an eyeshadow quad, but I had a few other shadows that I wanted to depot. So I got this to house them and keep them all in the same place for now. I have a mixture of Annabelle, Urban Decay, and MAC in it. So they do fit other shadows, if you so choose to depot any of your own. Since I got my new palette, I couldn't just leave without getting a new color or two for it. Well, I could have...but where is the fun in that?! 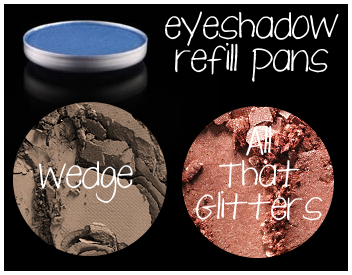 ;) I don't really find that All That Glitters swatch from the site to be true-to-color. When I do my swatches and reviews, I'll try to show the real color a little better. It's lovely in person! I've heard that this is quite comparable to Make Up For Ever's HD Microfinish Powder (which I almost got), but this has been getting good reviews on Makeup Alley. I swatched both on my skin and the textures feel the same and both seem to be of the same quality. I can't compare much beyond that since I only have the MAC one. MAC offers .28 OZ for US$21. MUFE (at Sephora) offers .35 OZ for US$30.